CP/CENT/INT/03/01. Sino-Soviet dispute materials assembled by John Gollan. Handwritten notes of texts of letters confidentially communicated to Gollan, mainly by the Soviet embassy in London, with some comments. Also Bert Ramelson's report of bilateral talks between CPSU & CP China. Created 1960-1963. CP/CENT/INT/03/03. Sino-Soviet dispute materials assembled by John Gollan:- Chinese documents on the dispute, with some annotations by Gollan. Created 1961-1969. CP/CENT/INT/03/04. Sino-Soviet dispute materials assembled by Jack Woddis:- documents from the international communist press, with annotations by Woddis. Created 1966-1969. CP/CENT/INT/03/05. Sino-Soviet dispute materials assembled by John Gollan:- Chinese and Soviet statements and reports of international conferences. Created 1963-1966. CP/CENT/INT/03/06. Sino-Soviet dispute materials assembled by John Gollan. Materials arising from the Stockholm meeting of the World Peace Council, December 1961 - report of the meeting, correspondence with the leaderships of the French, Italian and Chinese CPs on matters arising from the meeting, notes by John Gollan, Bill Alexander, etc. Created 1961-1962. CP/CENT/INT/03/07. Sino-Indian border dispute: collection of annotated press statements from the Chinese side, CPGB EC statement and English & Russian press reports. Created 1962-1963. CP/CENT/INT/03/08. 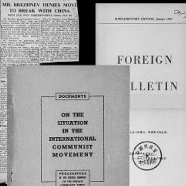 Sino-Soviet dispute materials assembled at CPGB centre:- documents and statements from the SED, French CP, Italian CP, CP Romania & Chinese Students in [...] . Also press reports. Created 1963-1967.